The scenes were similar this week in Jerusalem and in Washington, as Prime Minister Benjamin Netanyahu and President Barack Obama presided over Chanukah Candle lighting ceremonies and special events to mark the occasion. In Jerusalem, the prime minister lit the first Chanukah candle and delivered a stirring speech. 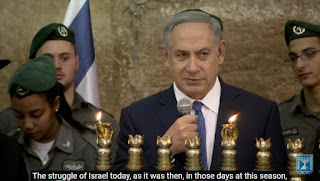 He likened Israel being a candle in the darkness 2200 years ago when the Maccabees defeated the Seleucid Greeks to today's struggle against forces of darkness for our existence, independence, culture, and for all humanity. 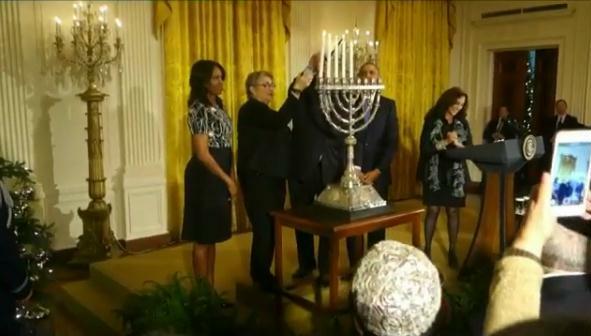 At the White House in Washington, Israel's President Reuven Rivlin lit the fifth Chanukah candle on Wednesday evening as President Obama looked on. Before the lighting and singing of Chanukah songs, the two presidents delivered welcoming remarks to an invited audience of Jewish leaders including our Los Angeles bureau chief, Esther Kustanowitz. For those of us who weren't invited, the video clip below provides a peek inside the White House and an insider's view of the celebration.